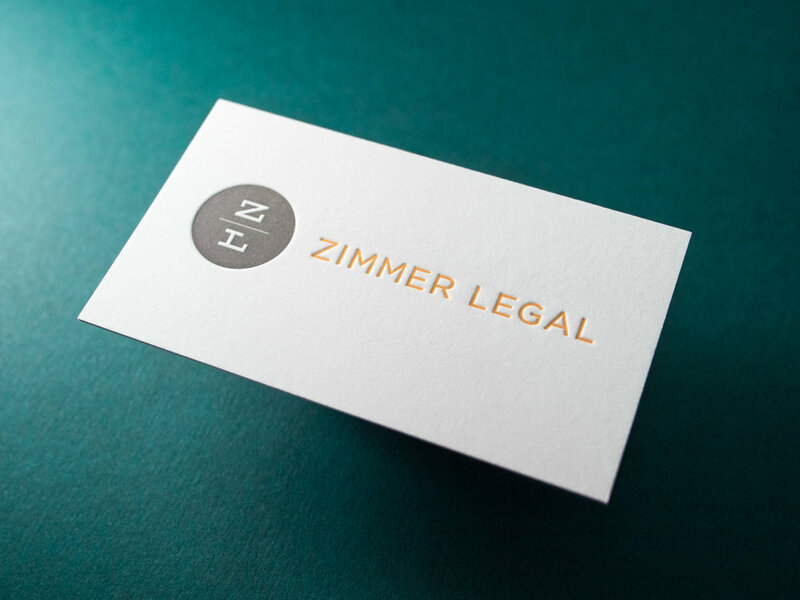 2/2 cards on 500g Savoy for Vanessa of Zimmer Legal. Slick design by Philip Lowe. This Savoy stock is becoming a favorite for business cards. 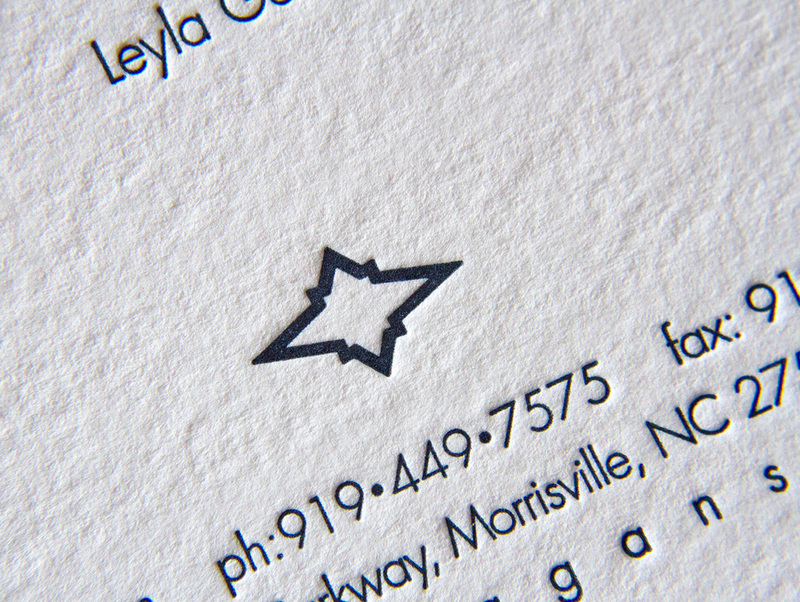 It isn't crazy thick, but it's enough to allow for two-sided letterpress without much impression show-through. Posted in business cards and tagged with savoy, brilliant white, logo, double sided, 500g, 30pt, attorney, lawyer. September 28, 2017 by Travis Friedrich. 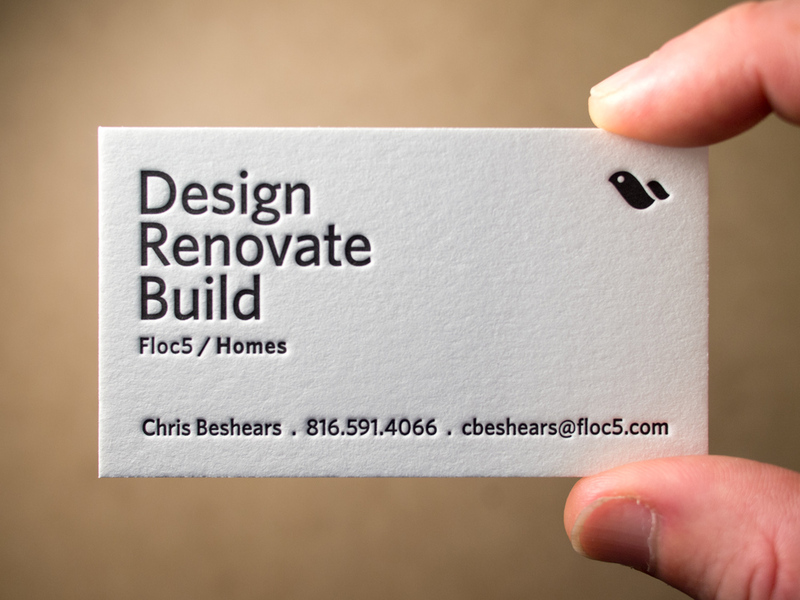 Here we've got a couple of sweet business cards designed by Sarah at Kansas City's Floc5. Connect with them on twitter (@floc5) or at their website. The first is for Floc5 Homes — printed in rich black ink on thick, bright 600g Fluorescent White cotton stock. Next we've got skinny cards for Amy Slattery of the architecture firm Odimo. We printed these with custom gray and flame red inks on 500g cotton Savoy and finished them with edge paint to match the ink. Posted in business cards and tagged with fluorescent white, black, 600g, red, edge painting, architect, skinny, savoy, 500g, orange, gray, client designed, graphic design. July 26, 2016 by Travis Friedrich. For Australian freelance makeup artist, Claire Vyverberg, we printed these slick but pillowy cards on 500g Somerset paper. 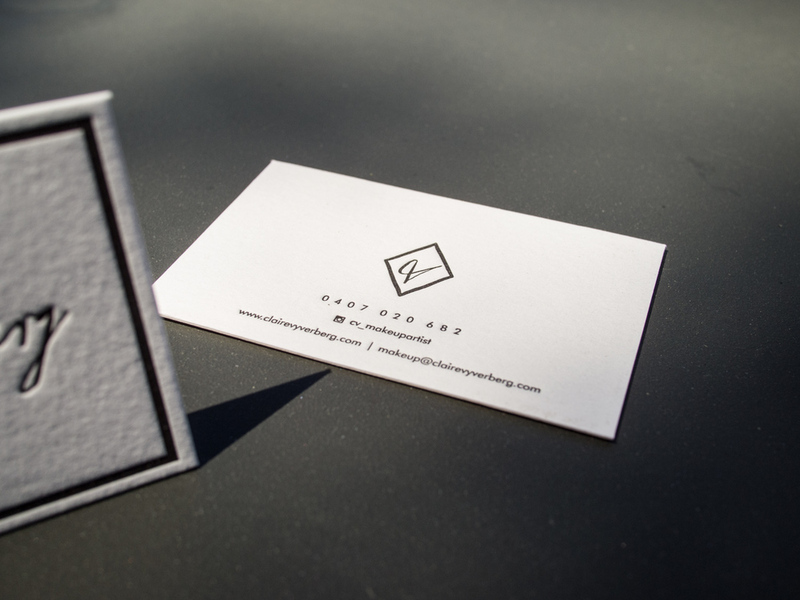 Posted in business cards and tagged with black, radiant white somerset, 500g, cotton. December 15, 2015 by Travis Friedrich. Parklife Press is grateful to have earned a lot of repeat business for business cards — new hires, change of information, and promotions all require updates and re-orders. But seeing and working on cards for new clients is always fun, and here are a few new ones to show you. 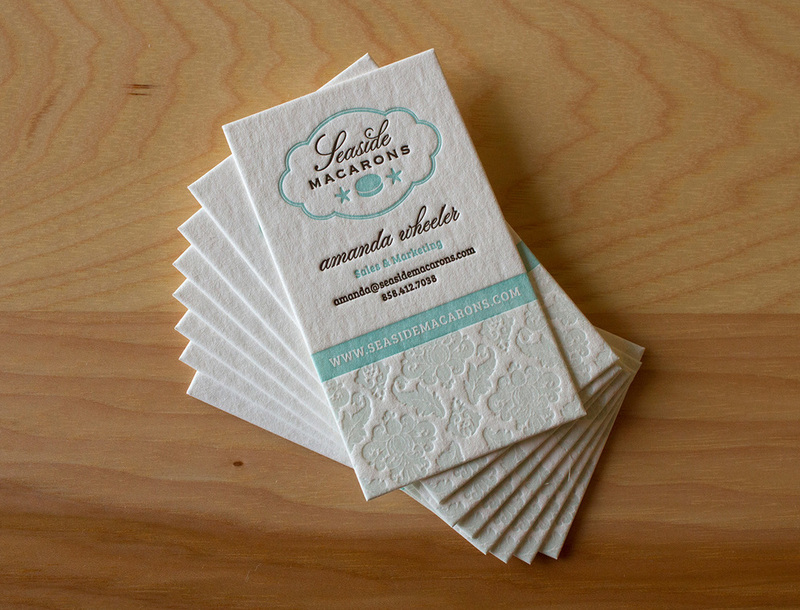 Using the "dessert first" philosophy, we open with this confection of a card for Seaside Macarons of La Jolla, California. The logo and design were custom-made by Parklife Press. The card features three custom inks printed on 450g Wild stock (a brown, a cheerful robin's egg blue, and a lighter tint of that blue, used as the pattern on the lower half of the card). 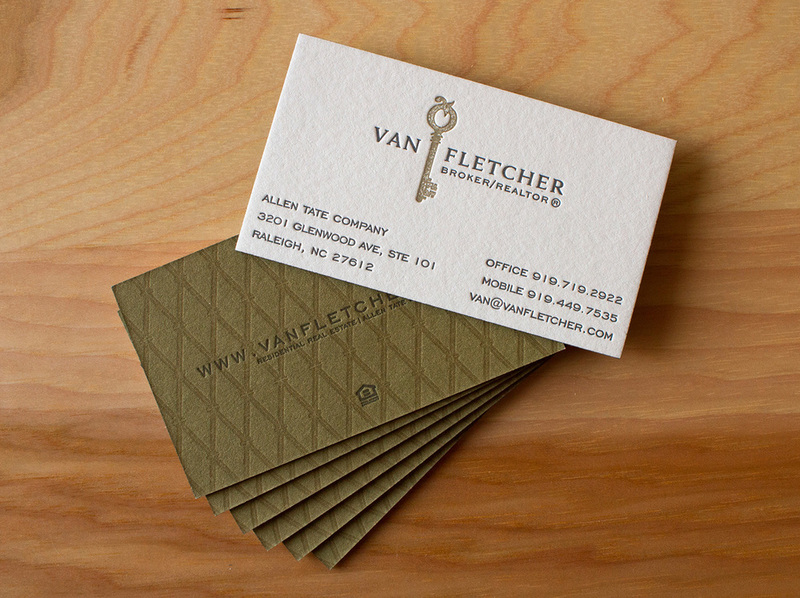 Next we have Broker/Realtor Van Fletcher, of Raleigh. Each side is printed with two custom inks. The sides are then glued back to back (a process called "duplexing"), trimmed to size, then edge-painted. The front features a two-color logo with key illustration and the back has two letterpress inks printed on top of a flat offset-printed flood. This gives the back a textured, almost quilted appearance. They are truly luxurious cards. And last but not least, we have these art deco inspired cards for Leyla Gans of Morrisville. The cards are eye-catching for many reasons, perhaps most notably the die-cut rounded edges — the angular graphic starburst design is balanced by the card's contours. They're printed in Midnight and Gold inks on 500g Radient White Somerset stock. Posted in business cards and tagged with custom ink, duplex, edge painting, custom design, custom logo, 450g, wild, 500g, radiant white somerset, gold, midnight, offset, die cut. February 25, 2014 by Sarah Arneson.